Le séminaire s'est conclu avec la proposition d'établir un réseau de professionnels travaillant dans différents centres de traitement de la dépendance à la drogue dans le pais, afin d'échanger leurs connaissances et expertise, d'harmoniser leurs pratiques, d'élaborer des lignes directrices et de partager des données. Pour en savoir plus, en Anglais, veuillez lire les informations ci-dessous. 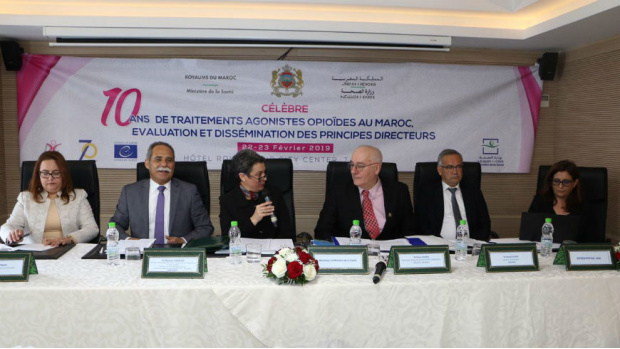 With a regional seminar organised on 22-23 February 2019 in Tangier, the Ministry of Health of the Kingdom of Morocco and the Pompidou Group celebrated 10 years of the introduction of opioid agonist treatment in the country. Taking place within the 2019 MedNET work programme, the seminar brought together addiction treatment centers from across the Kingdom of Morocco, as well as experts from Tunisia, Jordan, Portugal and Switzerland - which just joined MedNET as its 16th member country. One of the main outcomes of the seminar was the proposal to set up a network of professionals working in the different addiction treatment centers in the country, in order to exchange knowledge and expertise, harmonise practice, elaborate guidelines, share data and collaborate with the Moroccan Monitoring Center on Drugs and Drug Addiction with the aim of improving communication between practice (professionals), research (data collection) and policy (Ministry of Health). The Co-operation Group to Combat Drug Abuse and Illicit Trafficking in Drugs (Pompidou Group) is an inter-governmental body formed in 1971 at the initiative of the late French President Georges Pompidou. nitially, this informal forum consisted of seven European countries – France, Belgium, Germany, Italy, Luxembourg, Netherlands, United Kingdom – looking to share their experience of combating drug abuse and drug trafficking. The cooperation was subsequently extended to include new countries. In 1980 the Group was incorporated into the institutional framework of the Council of Europe and at present it comprises 35 member states.